Southwest Chopped Salad with Avocado Cilantro Vinaigrette – It’s one of the best salads I have ever had. 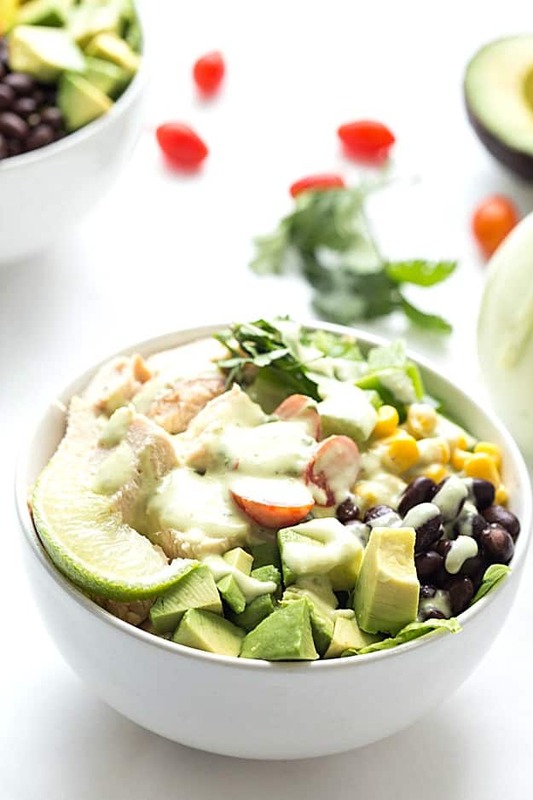 Each bite contains crisp romaine lettuce, black beans, corn, diced green bell peppers, avocado, chicken and few cherry tomatoes. 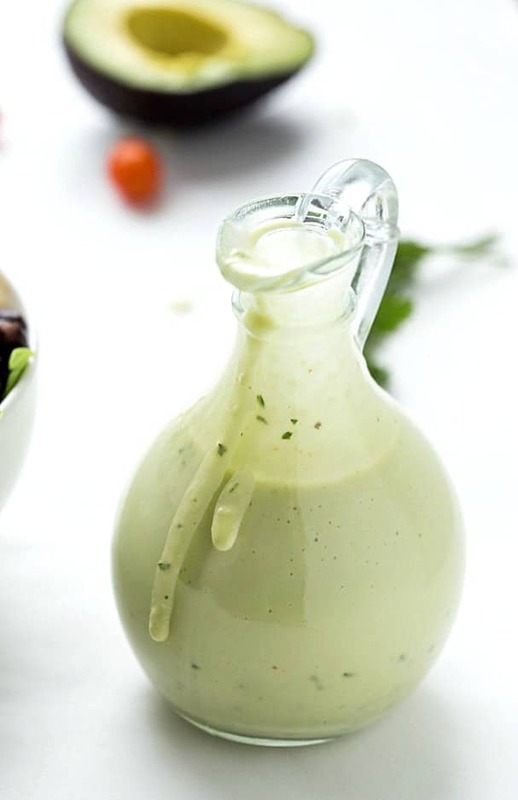 The zesty and creamy avocado vinaigrette with cilantro make the salad oh-so-delicious! If you haven’t already noticed, I love easy, simple, and delicious meals. After a long day who wants to spend hours upon hours in the kitchen preparing an elaborate meal. I know I do not, and I am sure we can agree with that. Easy and straightforward meals do not have to be boring. They can be fun and colorful, just like this amazing salad I am sharing with you today. The two stars in this salad are the chicken and the vinaigrette. The vinaigrette you guys, it’s the best I have ever had. It’s creamy, it’s tangy, and bursting with flavor. It’s the kind of vinaigrette I know I will be making over and over again with every salad. The best part, it’s made under 5 minutes and so simple! 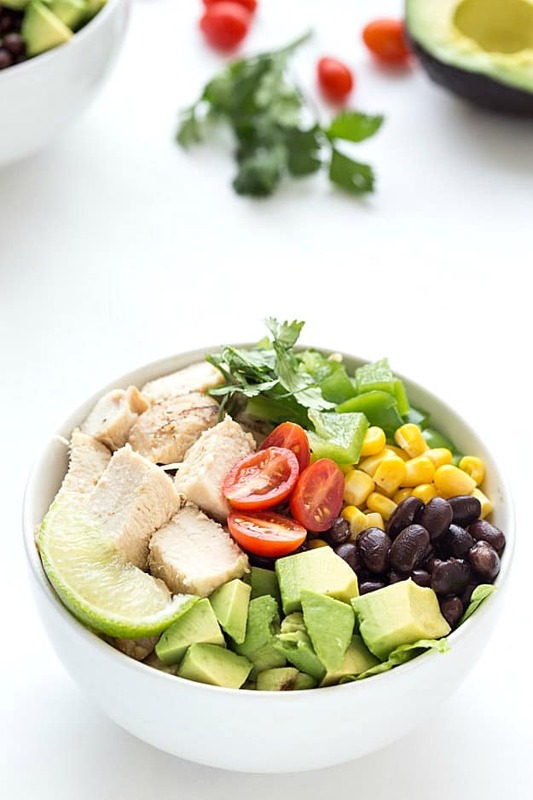 Let’s start with the basic staples this southwest chopped salad needs: crisp romaine lettuce, black beans, corn, diced green bell peppers, avocado, chicken, and a few cherry tomatoes. The extras you can add are cilantro and cheese. I added cilantro to the salad because I love cilantro. It’s a little more love than the average person has for it. I felt this southwest chopped salad did not even need cheese. There were already so many flavors and textures in this salad. So why is the chicken such a big deal in this salad? Well, for one, I do not like grilling or baking a few chicken breasts for a salad. I have always been this way; it’s strange. So I picked up a bag of Tyson already grilled and ready o-go chicken breasts strips at my local Walmart. These chicken breast strips are fabulous and help this meal come together in a matter or minutes instead of an hour or so. 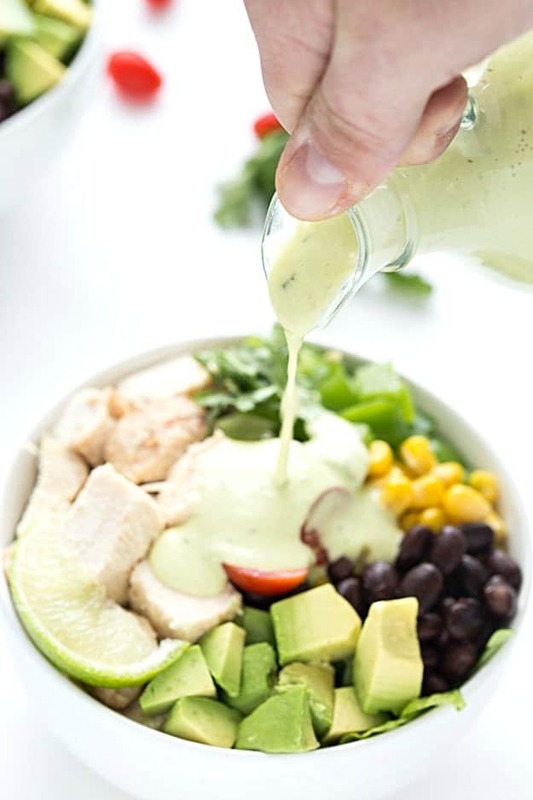 Now let’s chit chat about this creamy, tangy, and bursting with flavor avocado cilantro vinaigrette. The base of the vinaigrette starts with a ripe avocado, olive oil, white vinegar, cilantro, and Wish-Bone® Italian Dressing.. The Italian dressing makes the vinaigrette stand out and shine. It’s packed full of herbs, seasonings, and flavors for an extra zesty boost of flavor. It’s so delicious and takes a good salad to an excellent salad. 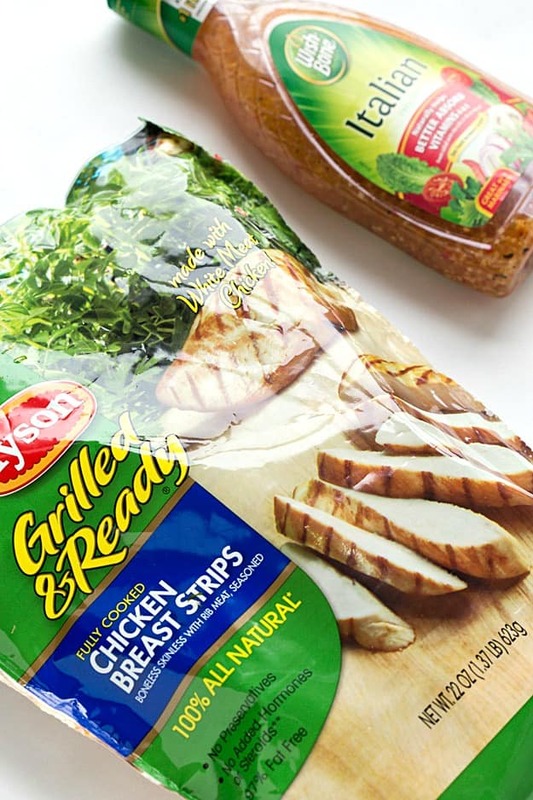 Check out, even more, recipes using Tyson® Grilled and Breast Strips and Wish-Bone® Italian Dressing! Pulse all of the ingredients for the vinaigrette in a food processor until creamy. Place the ingredients for the salad into a bowl and pour the vinaigrette on top. What are some of your favorite salad dressings? I would love to hear and try new ones! This looks really yummy! I love the combination of cilantro and avocado. I have been hunting for easy lunch recipes so I am going to print this and try it.